Is your windscreen chipped, cracked, scratched or even stained? Are your headlights foggy or scratched and you don't want to replace them? 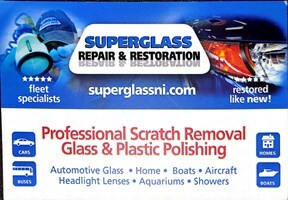 A mobile company specialized in Glass and Acrylic Repair. Please feel free to check our Facebook page and ask us for a quote. We don't replace windscreens then if you are not 100% satisfied we won't charge you at all. Check our before and after pictures you will be delighted! !